When you have a baby, a simple day out can feel like a major expedition, with diapers, strollers, baby carriers, toys, bottles, a change of clothes and everything else in between needing to be brought along. The idea then, of taking a family vacation with baby on board can feel completely overwhelming. Rest assured, it can be done! In addition to our collection of 40+ Tips for RoadTrips, here are a few tips that have worked for our family. I always pack a small “Mom’s bag of tricks”. This is a bag full of everything we might need during our journey that we keep in the car, readily on hand as soon as we need it. My bag of tricks contains diapers, change mat, baby wipes, snacks, water, soft toys, sunscreen, lip balm, hand sanitizer and tissues. This means that when we need to do an emergency diaper change I’m not having to rummage through the trunk looking for the diaper bag, or trawling through the glove department looking for a tissue. No matter what situation arises, everything I need is on hand, all in the one place. Bring zip lock bags. Babies make messes. It’s life. Unfortunately though, when you’re on the road, there isn’t always somewhere to dispose of diapers, food scraps or baby wipes and even if you have a waste bin in the car, there are some messes you just don’t want in there! Take along some zip lock backs, put the trash in a bag, zip it up and store it in the trunk until you can dispose of it properly. No smell, no leaks, no fuss! Try to schedule the start of your journey for your baby’s usual nap time. Feed your baby, change them, dress them in loose comfy clothing and then begin your drive. With any luck, you will enjoy a calm and peaceful start to your journey. If baby is fussing, take a break. You might be tempted to just keep going, wanting to make that next milestone on your journey before stopping, but this will just make baby even more upset and resettling them for the next leg of the journey will be rendered all the more difficult. Take them out of their car seat, feed and change them, and let everyone have a breather. You’ll all feel more refreshed as a result and baby will hopefully settle back for another nap during the next leg of the drive. When you arrive at your hotel, assess the room and set up zones. Create a zone for toys and play, a zone for a changing station, and a zone for bottles, food and snacks. Creating zones will keep everything organized and it will reduce stress because you will know exactly where everything is as soon as you need it. So what is my all time, biggest tip for traveling with baby? Patience, lots of it. Long car rides, changes of scene and new sleeping arrangements can be unsettling and confusing for routine-loving babies. Accept ahead of time that your journey may take several hours longer than expected, that it may take a little longer for baby to fall asleep, and that even the calmest baby might be a little upset and fussy. If you accept from the outset that little hiccups and delays are bound to happen, you’ll be all the more able to cope with them and take them in your stride, making a happier vacation for everyone. 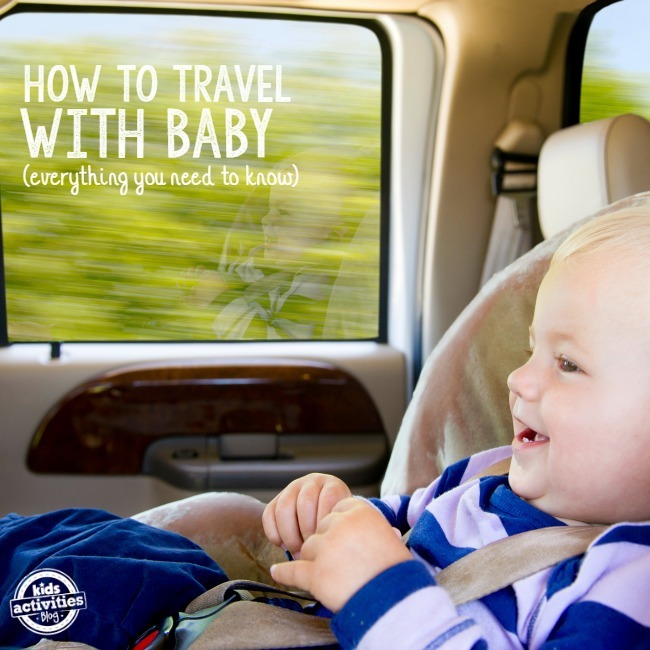 What are your favorite tips for traveling with baby? I’d love for you to share your ideas and tips in the comments. We always brought music that JDaniel loved to listen too. Wow! Whenever I read pages like this I realize how lucky I am. Our 5 month old went on her first long road trip a month ago and she handled it brilliantly. She cried once because of a dirty diaper the whole trip, and we stopped at the next gas station for a change. She enjoyed watching the scenery, making all sorts of new friends, and wasn’t even phased by sleeping in a new place. We didn’t bring any special new toys, in fact we forgot her favorite stuffed animal, and she didn’t seem to care. The new things excited and entertained her enough that she never played with any of her toys until we got back home. Thanks JDaniel4’s Mom. That’s a great tip! Thanks for stopping by Nadine. Will check it out. That is wonderful Andi! It certainly makes for a happy holiday when baby travels well. Thank you for this list. We are planning a 14 hour road trip to see family with a 7 year old, a 4 year old, and a 9 month old! Eek! Wish us luck! I’m a first time mom with 2 new wonderful step daughters. Never have I had anything close to an experience like this!